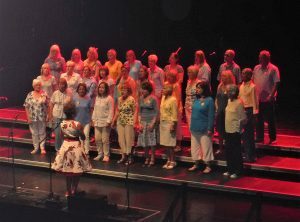 A WONDERFUL performance at The Brighton Dome. Who’d have thought this could arise from our Thursday and Friday morning fun?! A cold, wet and windy day deterred only a few, and most of you kept the faith and turned up, as per usual, on a deserted seafront. 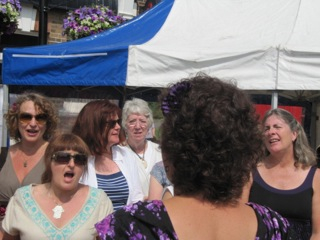 We were rewarded with a break in the weather and had another rousing sing. Thank you, you are marvellous! 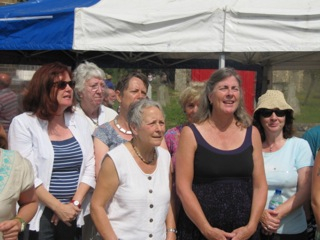 Another great affair, thanks to your spirit of fun and adventure, helped by a gorgeous summer’s day. 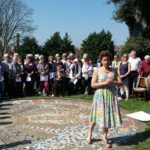 We had a beautiful Spring day, a wonderful turnout and a receptive and encouraging audience – ingredients for a lovely day. 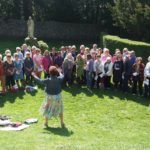 Another fabulous sing. The array of Christmas hats gets ever more elaborate, this year seeing voice-activated LED lights sewn into a Christmas hat! As well as our now usual Christmas songs, we sang Hail Smiling Morn and The Angel Gabriel. 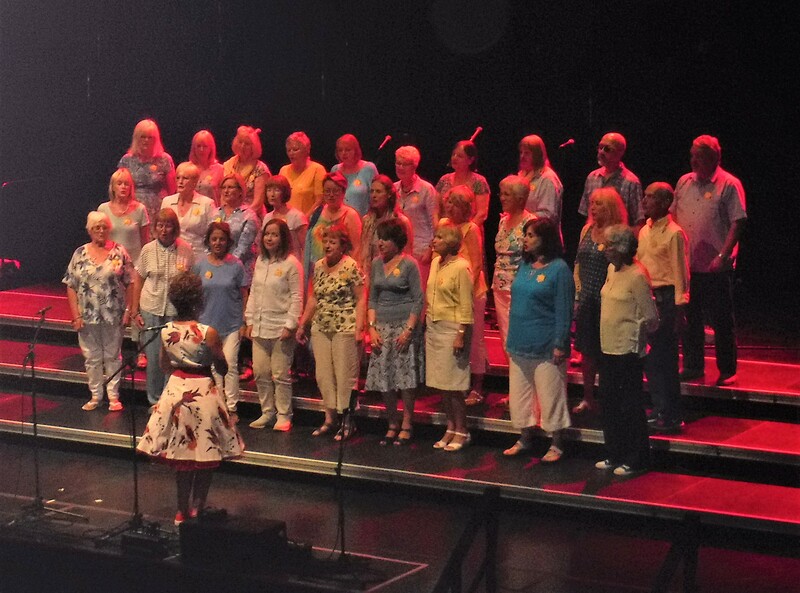 The occasion is made possible by Cathy Watts, Martin Poole and everyone’s spirit of fun, choir and audience. Thank you! And we raised £100 for Cure Clubfoot. 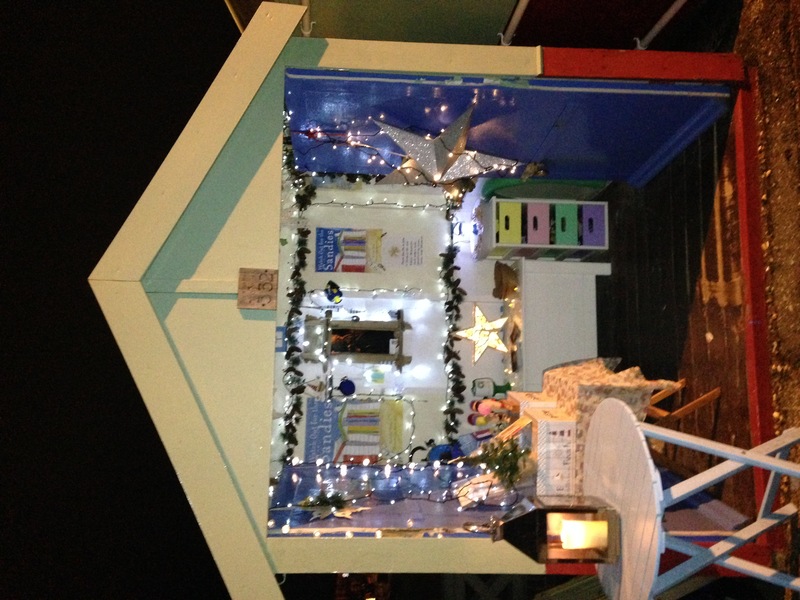 Thanks to Cathy Watts, owner of beach hut 332 and Martin Poole of Beyond, we were the ‘creative, festive surprise’ behind door 11 of the Advent Beach Huts this year. We sang Tourdion, Here We Come a-Wassailing, Star of Wonder and May Your Cup and collected money for Cure Clubfoot. 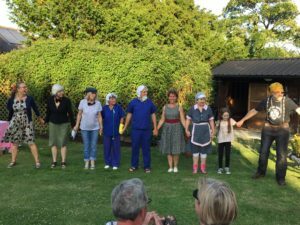 Great fun, thank you everyone who took part and our audience. 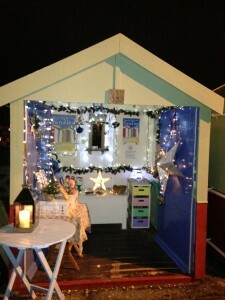 Here is Cathy’s sparkly beach hut. For more pictures of the evening, have a look at our Facebook page. 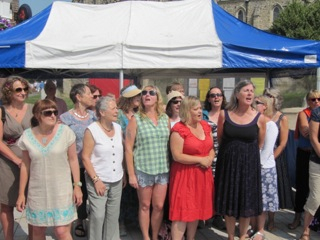 Our 3rd year busking at the amazing Farmers’ Market in Shoreham. 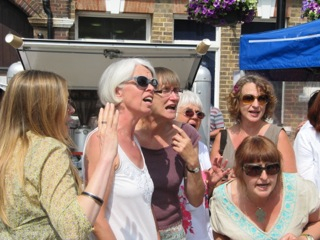 The sun shone and the singing was wonderful! There is a video on our FB page. 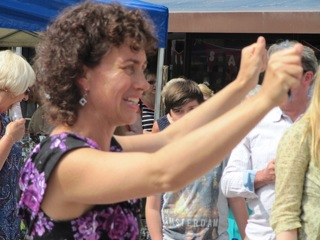 What a lovely day was had by all! 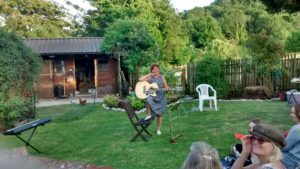 Thanks to Cathy for allowing us to have our party in her beautiful home and it was lovely to fill the barn with the Blue Moon – a long way from what the Augustinian monks or the farmers may have sung. See FB for some pictures of the day. 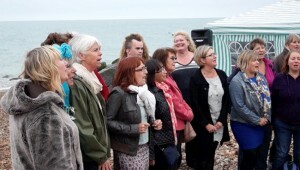 Once again, a wonderful sing outside Beach Hut 332, raising money for CUREclubfoot as part of the annual Advent Beach Huts on Hove promenade. 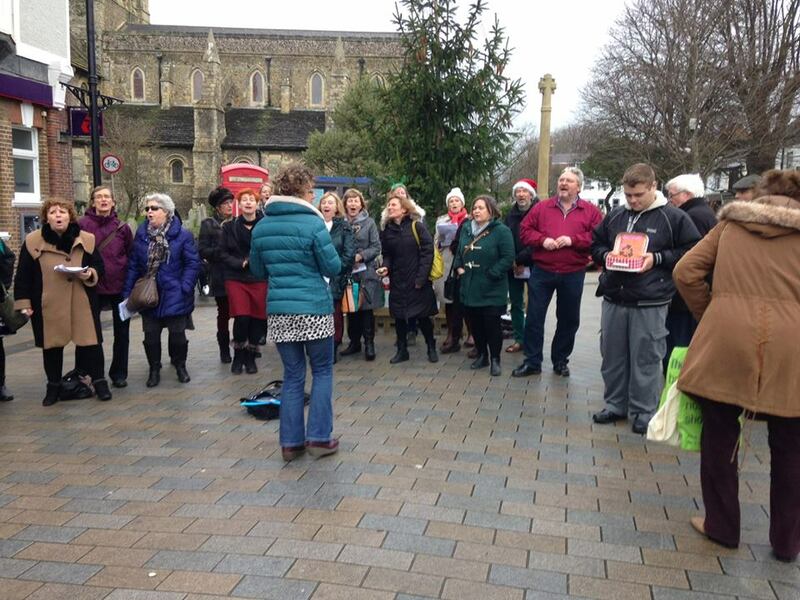 What a great turnout despite the wind, with some of you from as far as Worthing! 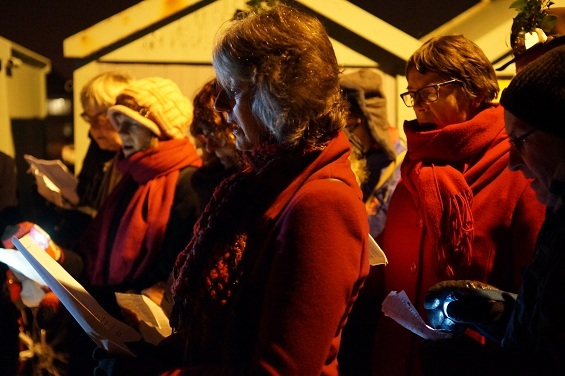 We sang The Copper’s Christmas Song, Gaudete, Gaudeamus hodie and others, followed by mulled wine and mince pies. There are some videos capturing the lovely atmosphere on Facebook. Thank you to everyone who came. 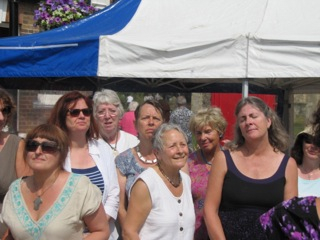 Singing in Shoreham High Street to raise money for SOLD – Shoreham Opportunities for people with Learning Difficulties before heading to The Beach House for a fabulous Christmas lunch. 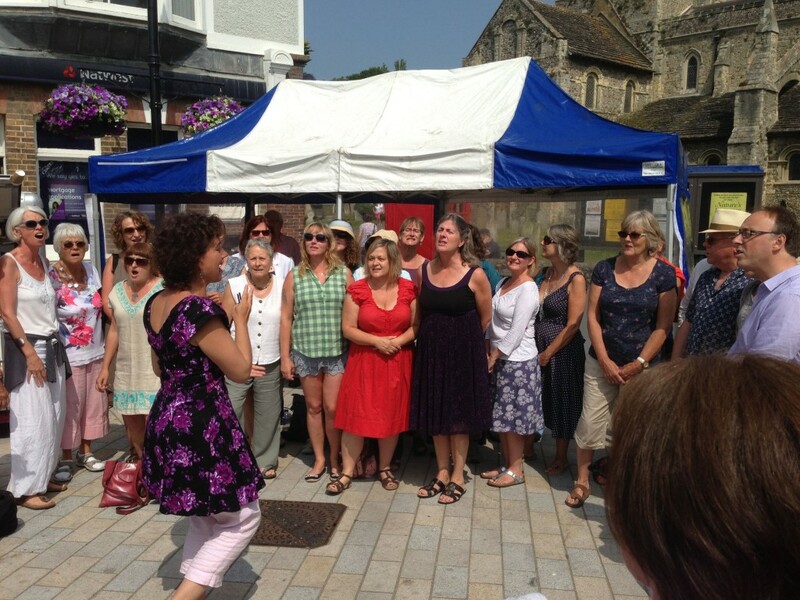 For the second year, we busked at the Farmer’s Market in Shoreham. We sang Da Doo Ron Ron, I Stand Tall, Great Day and It’s a Wonderful Life. 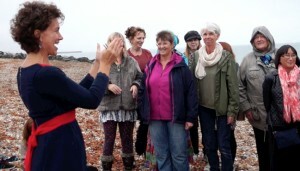 We received many positive comments about the lovely sound we made and the fun we seemed to be having! The Dawn Chorus sang several train-related songs as part of these celebrations up and down the line, including the beautiful folk ballad 10,000 Miles and Curtis Mayfield’s People Get Ready. Joined by choir members Linden and Stuart and the Brighton Acoustic Jammers, the crowd joined in with our finale, This Train is Bound for Glory. It was a wonderful sunny morning and a lovely atmosphere. 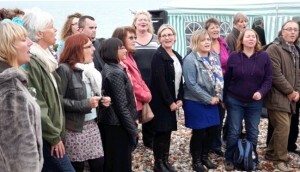 We were invited by St Luke’s Church to sing at the annual Advent Beach Hut Surprise on Brighton and Hove seafront. 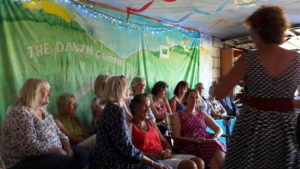 We sang at Cathy Watt’s beautiful beach hut, decorated with Christmas whimsy and supporting her charity CURE.org. 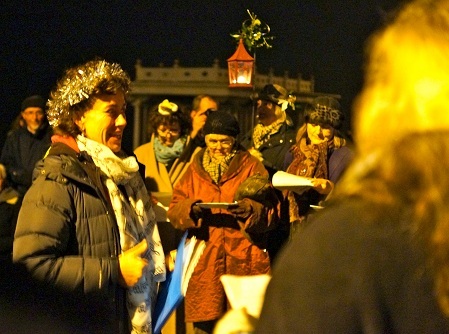 It was a chilly evening but we thoroughly enjoyed singing Dona Nobis Pacem, a Gloucestershire Wassail and a few carols. 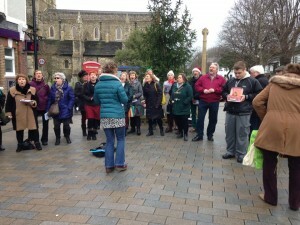 Thank you to everyone who came and sang, and to friends and family for their warm support, and mulled wine. 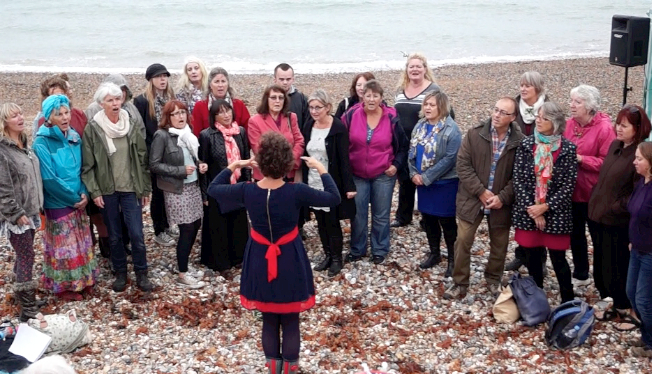 On Saturday 21st Sept we were invited to celebrate the Autumn equinox and sing on Shoreham Beach for the annual Sand Dance. At this time of year the tide is at its lowest and the sand is revealed. 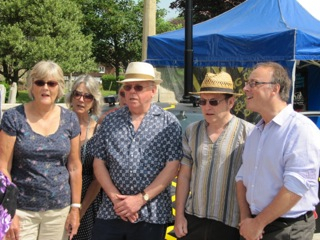 As it was also World Peace Day we sang a new song “Peace in Our Time” by Nick Prater. 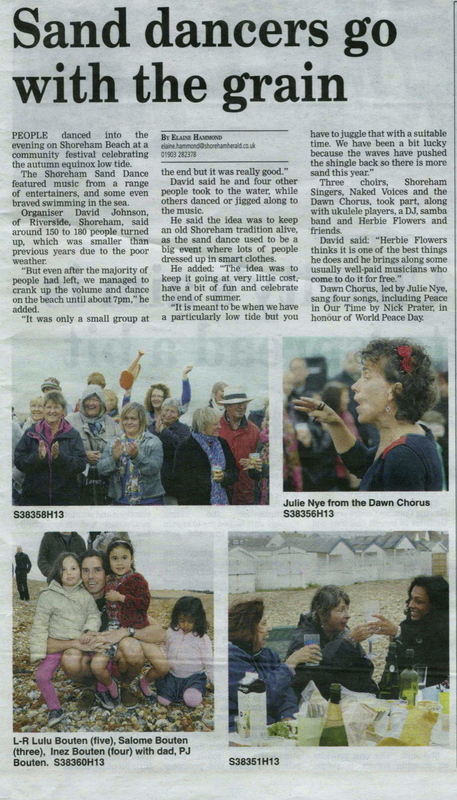 Thank you to everyone who came and sang, and to friends and family for their wonderful support, and to the Shoreham Herald for a great write up. 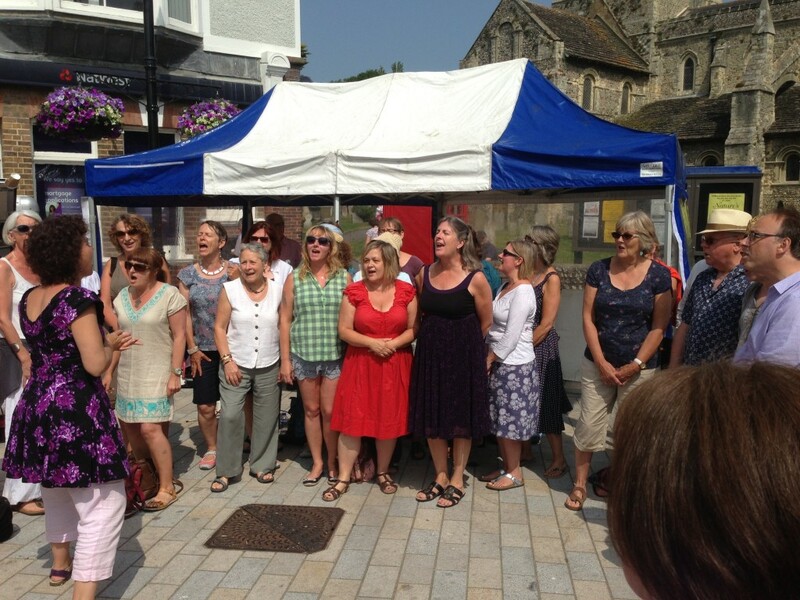 Our debut busk took place at Shoreham Farmer’s Market on 13th July 2013 and was a huge success. 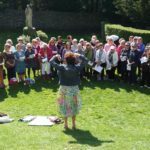 Thank you to everyone for bringing your best voices, and helping us all enjoy a wonderful day.